One of the mediation couples was particularly special this week. They had been together over 20 years, had children, and did not want their separation to ruin what remained, a friendship. After four hours they left with smiles and tears, and a full agreement. This is why I do mediation, why it is better than litigation. Neither of them got everything they wanted, but they did not ruin their friendship, or tear into each other or their kids to get separated. They took on some tough stuff, and worked it through. 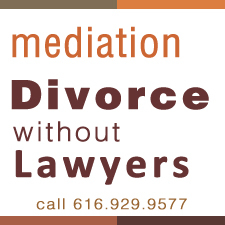 Nothing in mediation stops you from going to court until you have that full agreement. You can try it before you divorce, during the process, whenever. If you have lawyers, have the lawyers send written statements and either attend or be available by phone for questions. This is your deal, no one else owns the problem.